In 2005 I purchased an eBook from Amazon protected with Adobe DRM (Digital Right Management) system. When I opened again today I had the surprise that I could not open anymore because I copied on a different computer. 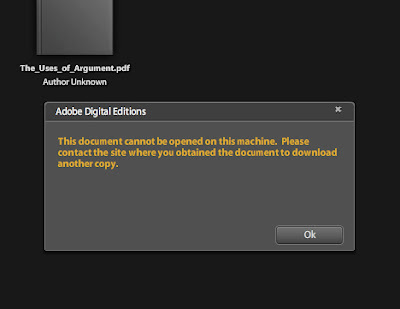 Adobe Digital Edition tool asks me to contact the vendor of the eBook and download a new copy for the new computer. This item has been removed from our catalog and is no longer available for download from Your Media Library. We apologize for the inconvenience. Of course this experience will prevent me to buy DRM-protected items in the future. I really hope that this insanity (the DRM) will end soon! !